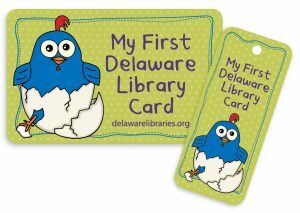 Delaware Libraries offers two new cards for Kids! My First Card for birth to 5 years, and a Super Library Card for kids 6-12 years. What is a My First Card? A new library card targeting babies, toddlers, and preschoolers (Birth to 5). Delaware’s First Lady, Tracey Quillen Carney is honorary chairwoman for the library card campaign. What is a Super Library Card for Kids? A new library card targeting school-aged children (6-12). The Super Library Card was launched at the Dover ComicCon in August 2018. Q. Who can get a card? A. Any child in the target ages. One year, the same as regular library cards. Both cards can be used to check out only Juvenile materials (no Teens or Adult material, including Teen games and DVDs). There will be a limit of 12 items and there will be no overdue fines. Charges for lost or damaged items will still occur. What if my child already has a card? You can get a My First Card or Super Library Card for free. Your old account will be closed and a new account will be set up. You will receive new library cards. How do we use the “trackers”? Every time your child comes to the library their tracker card will get stamped. After 10 visits (10 stamps) they will receive a prize. For the My First Card they will receive a growth chart. 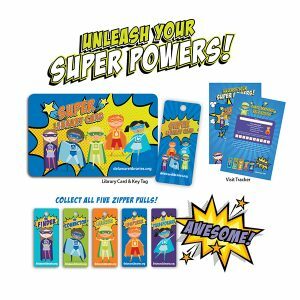 For the Super Library Card they will receive a zipper pull. There are 5 designs so your child can work to collect all 5 zipper pulls!